Mexico is the world leader for avocado growing, accounting for almost 35% of global production. Other important avocado producers include the USA and Indonesia (each with 7% of the world total), Colombia (6%), Brazil (5%) and Peru (4%). In Mexico, avocado production is heavily concentrated in the state of Michoacán. The main areas of avocado orchards are near the cities of Uruapan and Tacámbaro. The annual harvest of avocados is now worth about 800 million dollars, and has increased extremely rapidly in the past decade. The total annual production of Mexico’s 21,000 avocado growers has risen to 1.2 million tons. Avocado-growing states. All rights reserved. Click to enlarge. The map shows the four main avocado-growing states. Michoacán accounts for 92% (by value) of all the avocados produced each year, followed by Morelos (2.5%), the State of México (1.3%) and Nayarit (0.7%). The Hass variety grown in Mexico fruits twice each year. The main harvest periods are January to April, and July to September. The average yield in Mexico is about 10.6 tons/ha. This compares with yields of 14 tons/ha on the Caribbean island of Guadalupe, 13.4 tons/has in the Dominican Republic, 13.1 tons/ha in Israel, 10 tons/ha in Cuba, 11.1 tons/ha in Colombia and 9.2 tons/ha in the USA. 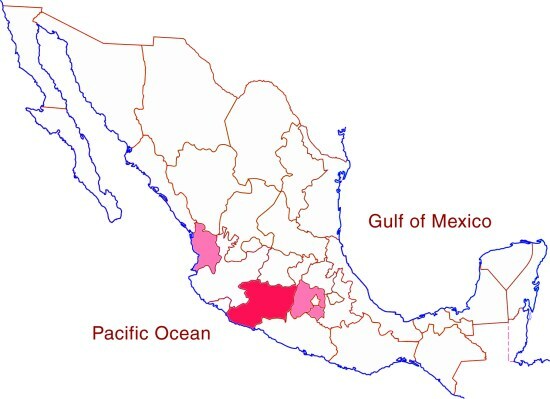 Area of avocado cultivation in Mexico (thousands of hectares). 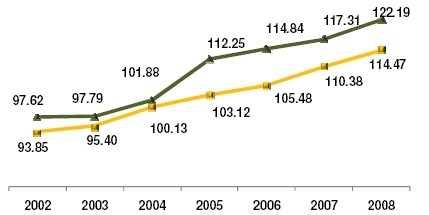 The green line is area under cultivation; the yellow line is area harvested. Currently, Michoacan has more than 120,000 hectares dedicated to avocado production, compared to only 90,000 hectares seven years ago. About half the area is irrigated. US trade restrictions limiting avocado imports from Mexico were lifted in 2005, and exports have climbed to more than 300,000 tons a year. This extraordinarily rapid increase in land area devoted to avocados, known locally as “green gold”, has come at the expense of natural forest. The rate of deforestation has prompted environmentalists to demand that state and federal environmental authorities regulate further land clearance. Environmental agencies have now agreed that is essential to regulate deforestation for avocado production in order to avoid further environmental damage. I am a Canadian and I have just read about the drug cartel taking over the avocado farming business in Michoacan state, where I have spent many a pleasant vacation. I found it horrifying and I cannot willingly be a part of it. In future I will be sure to source my avocados from California or someplace other than Mexico.